"I've been drinking two cups of Jiaogulan tea a day. The taste is great! The amount of tea for the price is amazing!" - Damon L.
Testimonials: I'm a huge fan of the Jiaogulan tea. I drink it hot and cold. I enjoy bitter tea, so I steep this tea for an extra 20 or 30 minutes. After I use the leaves to make a pot of tea, I mix them up in my fruit smoothie. This product is a must have for any tea drinker. I give it 5 of 5 stars. - Chuck H.
Testimonials: I absolutely love the tea! Honesly I didn't think I would. I didn't have a tea maker for one, and it just looked funny. But after reading about the many benefits and I'm so glad I did. Its absolutely delicious. Tastes like a strong green tea. It helps me to get my water intake in and less sodas or other flavored drinks . I feel a sense of balance drinking it as well. I sip it throughout the day and since it has no caffeine I don't have to worry about it keeping me up all night. 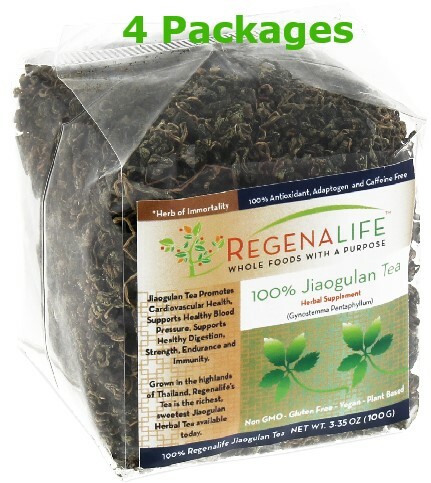 - Angie D.
Jiaogulan Tea may promote Cardiovascular Health, Healthy Digestion, Strength, Endurance and Immunity. It is in a rare class of herbs known as 'Adaptogens', which help the body to self-regulate without causing any harm or imbalance. Jiaogulan Tea may be especially helpful in building your body's natural resistance to stress. The amazing effect Jiaogulan Tea has on Cardiovascular Health has earned it the title of "The Herbal Heart Defender". Jiaogulan Tea may have a direct strengthening effect on the heart, possibly causing the heart to beat more powerfully. It may also have a host of secondary cardiovascular benefits, such as promoting healthy blood pressure. Jiaogulan Tea has been shown in laboratory studies to dilate blood vessels. 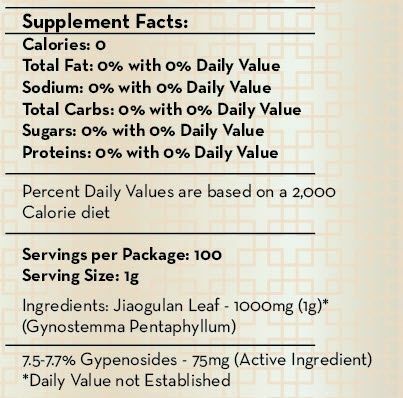 Ingredients: Jiaogulan (Gynostemma Pentaphyllum) tea leaves.